It’s an incredible statistic, but Motherwell FC are now the only team in the Scottish Premiership’s bottom six who haven’t changed their manager this season, writes Craig Goldthorp. Last week’s respective departures of Martin Canning from Hamilton Accies and Neil Lennon from Hibernian mean that Stephen Robinson is the sole survivor of gaffers in the bottom half of our top flight since last summer. Yet, as someone who is paid to read through Motherwell fans’ social media feeds on Facebook and Twitter every week, I can testify to the fact that Robbo has had his fair share of critics during this campaign. The main moans included the ‘long ball’ style of play, an overly physical approach and an apparent reluctance to blood youngsters in favour of going with tried and tested senior professionals living on their reputations from last season when two cup finals were reached. Being the messenger of these negative opinions when they are published in the Motherwell Times means I run the risk of being about as popular with certain members of the senior Motherwell FC hierarchy as Willie Collum at a Rangers supporters’ function. But – if I or any other ordinary workers make a mistake in their day jobs they get a rollicking – so I don’t think footballers or managers should be immune from criticism. And any angst towards me writing such articles would also be totally unjustified, as a quick look back at the stories in which I expressed MY opinions on all things Motherwell FC will reveal that I have always stuck up for Robbo and his players. Last season’s achievement of finishing runners-up in the Betfred Cup and William Hill Scottish Cup was exceptional and we were unlucky to face Celtic in both finals. It is extremely tough to beat one of the big two in Glasgow when your fans are outnumbered four to one. Reaching these finals was brilliant for the club financially and both runs were exhilarating. Although the early stages of this season inevitably had their disappointments, the improvement shown by the team in the last few weeks has been immeasurable. 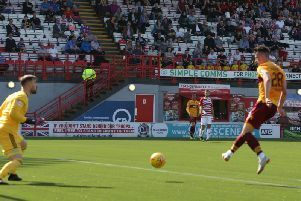 Four league wins in a row, the inspired promotion of Jake Hastie to first team status, the addition of lightning fast and skilful winger Gboly Ariyibi, the return of Ross McCormack and signing David Turnbull on an extended contract have all boosted the mood. As has Robbo’s bold decision to ditch the long favoured 3-5-2 formation for an exciting new 4-3-3 approach which allows the team to play attacking, passing football which is much more pleasing on the eye. So, aside from the hugely disappointing 2-1 home defeat by Championship side Ross County in the fourth round of this season’s Scottish Cup, 2019 has been a belter so far. And I’ll continue to give my honest opinions during the remaining weeks of the campaign.